IT'S fair to say the quality of footy on offer at the MCG on Thursday night wasn't at a premium. But for Richmond and its coach Damien Hardwick, another four points were banked and a season that threatened to teeter on the brink becomes that little bit more stable. Although question marks have been dispersed over both of the side's opening two victories to start the year, the Tigers are playing with a passion hardly seen throughout a dour 2016 campaign. Attempting to move the footy with speed at every opportunity, the side's endeavour, if not their skills, can't be questioned. The players are enjoying their footy again and, crucially, are playing for each other. 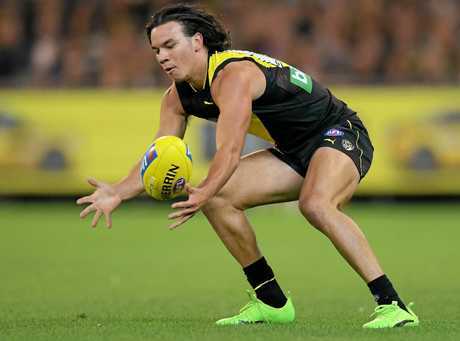 According to young forward Daniel Rioli, it was a summer bonding session that formed the foundation for that positive outlook that is now flowing through Punt Road. And it might be the main influence behind the club's impressive start to the year. "The boys have really bonded together," Rioli told foxfooty.com.au after the match. "We had a conversation with everyone in the group (during pre-season) about what our strengths and weaknesses are and how we can get better. "We really opened ourselves up and we all love each other. I think that's why we're playing this exciting brand of footy. We all really trust each other." Having been lauded for their ability to force turnovers against Carlton last week, Richmond's 'Three Amigos' up forward - Rioli, Jason Castagna and Dan Butler - were at it again on Thursday night. 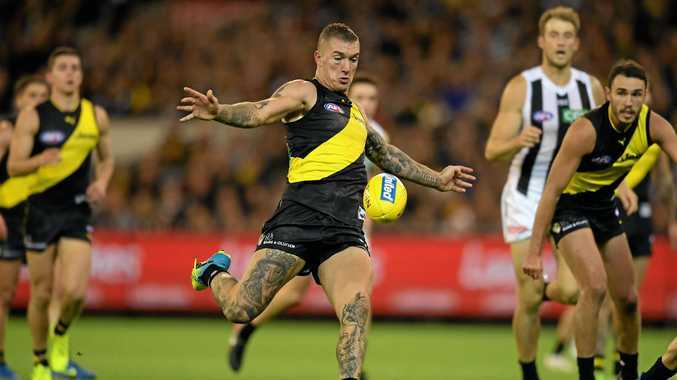 The trio continued to apply relentless pressure, with the Tigers kicking 63 points from forward-half turnovers according to Champion Data - almost matching the 66 they booted last week. Crucially, the three also again impacted on the scoreboard, with Rioli enjoying having them by his side. "It's so good having them around," he beamed. "I know that I've got Butters and Jason doing their job by my side and it really helps us as a small forward group. "We came into the game tonight focusing on our defensive pressure and trying to turn the ball over. Having them around makes it so much easier to do that and win the footy back." Rioli has made an impressive start to the season, looking to consolidate on the promise he showed throughout the 18 games he played in his rookie campaign last year. On Thursday night, he amassed 13 disposals to go with four entries inside 50 and a goal. But the talented 19-year-old, who was recruited to the Tigers with Pick 15 in the 2015 national draft, believes his form is a by-product of the way the team is playing. "We've always had confidence," Rioli said. "We all play our role and we all play to our strengths. That's what we did tonight and we played an exciting brand of footy. "We've focused on our defensive pressure and trying to go through the middle." According to Rioli, the confidence sustained from the two season-opening wins is now permeating through the group. "It's pretty good," Rioli said. "You get a bit of confidence from the win, so it's good to get a couple of them on the board to start the season. "Now we just look forward to next week and hopefully make it three."